This update is only for some editorial changes and is NOT a new version. 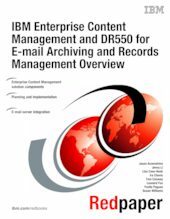 This IBM® Redpaper publication provides an installation and configuration guide for an e-mail archiving reference implementation. This solution leverages the use of DR550 and major IBM software components, such as Content Manager, CommonStore, and Records Manager. The objective is to create and validate the architecture that enables the use of DR550 to support an end to end Information Lifecycle Management (ILM) scenario by demonstrating, with Lotus® Domino® or Microsoft® Exchange, e-mail archiving and retention scenarios. This document is intended for IT professionals who are responsible for building and implementing the environment associated with ILM deployments.